Before Princess Diana, Duchess Kate or Meghan Markle, there was Princess Grace, the original fairy-tale princess bride. 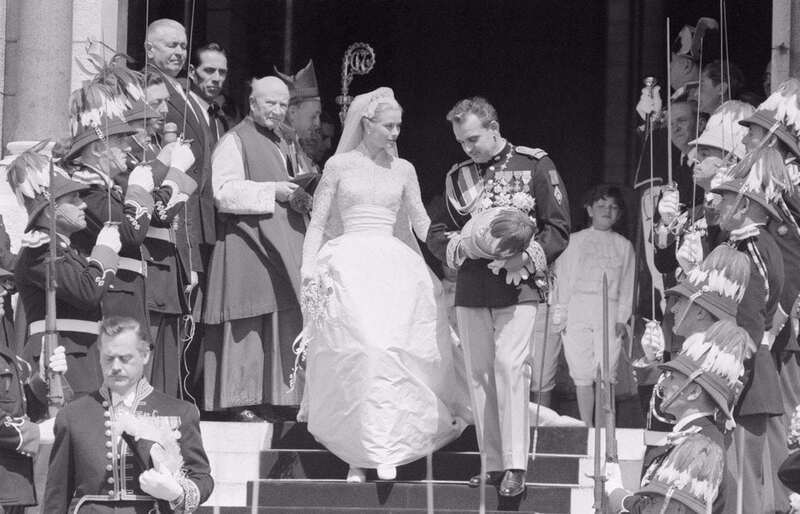 Glamorous movie star Grace Kelly wed Monaco’s Prince Rainier III on April 19, 1956. They met while attending the Cannes Film Festival in 1955. After a yearlong romance, the couple made things official in a lavish ceremony that outdid previous royal weddings. Grace Kelly’s wedding dress is every bride’s dream gown. It is the very symbol of a fairy-tale wedding. The high-necked, long-sleeved dress, made from 125-year-old Brussels lace, taffeta, and thousands of hand-sewn pearls had a long, billowing skirt and a 10-and-a-half-foot-long train. Fun Fact: Gracy Kelly’s magnificent gown was designed by none other than MGM’s costume designer Helen Rose who designed dresses for acting icons such as Elizabeth Taylor, Jane Powell, Debbie Reynolds, Cyd Charisse, Vera-Ellen, and Lana Turner.